Carbocations arise so frequently in Organic Chemistry that recognizing them must become second nature. After reading this tutorial, you should be able to eyeball a molecule and determine where a carbocation is likely to form as well as its potential stability. 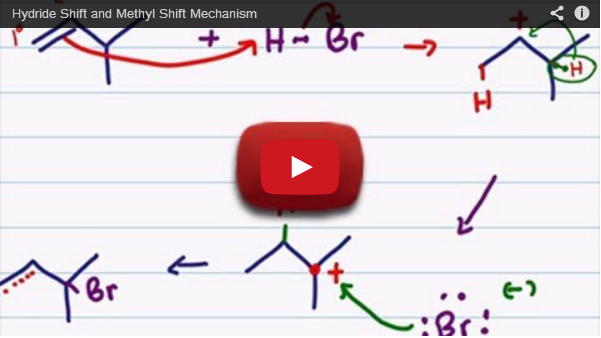 This will help you master carbocation intermediate reactions down the line including Markovnikov alkene addition reactions, unimolecular substitution SN1, beta elimination E1, and so much more. What makes a carbocation and what determines whether or not it will be stable? I frequently see this written as CARBONcation. But it’s CARBOcation. Carbocations are sp2 hybridized with an empty ‘p’ orbital sitting perpendicular to the molecule. This is EXTREMELY important in understanding the stereochemistry of reactions. Carbocations form when carbon loses an electron in the form of a bond or electron pair. The carbocation is left with 3 sigma bonds only. These are made from the hybridization of s + p + p.
Recall from your molecular geometry that sp2 hybrids are 120 degrees and trigonal planar or ‘flat’. When looking at the movement of electrons or positive charges, it’s easy to imagine the positive charge as a physical thing that can move from atom to atom. This is true for negative, but NOT positive charge. Think back to the day before your last crazy exam. Are you like me where you get ‘in the zone’ and forget to eat? You sit there, studying as your stomach grumbles away. Let’s ignore physiology for this example and simply think of the feeling of hunger! Does it feel like there is something physical in your stomach? Or is that feeling of hunger better described as the feeling of loss? Buffets are dangerous for me. I love food. And when I’m full I regret that I can’t eat more! So you pull a Leah and eat, and eat, and eat, till you feel ready to burst. Is that feeling of fullness just a feeling, or is it the physical food pushing on the walls of your stomach as your intestines try to keep up and help with digestion? Food is physically pushing on the walls of your stomach. But what the heck does this have to do with carbocation stability? Think of carbon as a hungry atom. It likes to have the right amount of food – a full octet with a formal charge of zero. When carbon has too many electrons and gains a formal charge of negative one, that negativity is the measurement of something physical. The extra food or electrons represent a physical something. These ‘electron’ somethings result in that negative charge. On the other hand, the carbocation is a hungry carbon atom. It’s empty stomach or ‘p’ orbital feels the hunger or positive charge as the feeling of a lack of something. Since the positive charge isn’t something physical, it is unable to move. Instead, a nearby atom can give ITS OWN FOOD or electrons to carbon via a carbocation rearrangement, filling up that empty ‘p’ orbital of the carbocation. After giving it’s electron up, the nearby atom will now feel hungry and feel its own hunger as a carbocation! Unless the nearby atom had extra electrons (food) and is sharing with carbon. 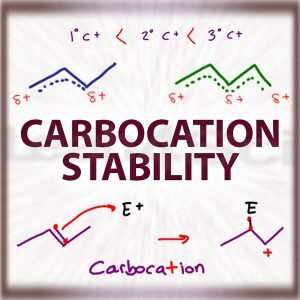 When you hear the term ‘carbocation stability,’ do you automatically assume that carbocations are stable? If so, then that’s opposite from the truth. Carbon atoms do not like having a positive charge! Some endure begrudgingly as we’re about to see. But do not think just because they CAN that they enjoy doing so. Both positive and negative charges are considered a burden and atoms will execute fierce battles and attacks to get rid of this burden. Stability isn’t a question of yes or no. But rather WHICH carbocation is more stable and therefore, more likely to form compared to less stable, and less likely form. As you can see from the trend, more substituted carbocations are more stable. Review the pencil trick if you can’t quickly identify primary/secondary/tertiary carbon atoms. BUT DON’T JUST MEMORIZE THIS!! WHY are the more substituted carbocations more stable? Once again, when trying to understand a difficult orgo concept, let’s give it some human characteristics! Carbocations are stabilized by neighboring groups due to hyperconjugation. Hyperconjugation is the result of a sigma bond overlapping ever so slightly with a nearby ‘p’ orbital. In our case, the empty ‘p’ orbital of the carbocation. Without actually donating electrons it manages to provide some increased electron density to stabilize the empty ‘p’ orbital. Once you memorized the word and definition, let’s step away from the concepts that make no sense. Nearby carbon groups provide moral support to the carbocation. Imagine your orgo professor decides to give you a 30-question homework assignment, the night before your exam… that is DUE on the day of your exam under the guise of helping you prepare. You’re mad! You’re fuming! You can’t believe your bad luck. You’re so upset. You’re now carrying this burden of anger. But, you chose to study in your dorm and your roommate is out with friends. You’re all alone and have no one to vent to! You’re stuck carrying that burden with zero support and that makes you VERY, VERY angry or unstable. Now imagine, your roommate returns for the evening and allows you to have a really good vent! You’re still carrying that burden but, perhaps you feel ever so slightly better? Your roommate understands and quickly texts your friends. One of them shows up right away and you vent all over again. Now you feel a bit better that you are able to vent to two people. While you’re still carrying that burden, it suddenly doesn’t feel AS bad. You have moral support on either side and you start to believe that, perhaps, you can do this! Now you have THREE people to vent to! You’re surrounded by moral support. You still have the burden. But you know what? They remind you that it’s not so bad. And 30 extra practice problems means you’ll be so much more prepared for that exam. You can finally sit down and tackle the questions. But, what’s this about a partial orbital overlap? Assuming you’re the huggy type (I love hugs), the overlap represents your friend, reaching over and giving you a supportive hug. A methyl carbocation is all alone. It’s carrying a burden it feels is too heavy with no moral support whatsoever. It’s very unstable and for the most part will NOT form under typical conditions in organic chemistry. The primary carbocation is not stable. It only has one friend nearby for limited moral support. The alkyl group friend, reaches over with an orbital hug, but it’s not enough to stabilize the burden on the primary carbocation. You WILL NOT see a primary carbocation forming under standard conditions. Avoid the primary carbocation like the plague in your Alkene and SN1/E1 reactions. The secondary carbocation has two friends providing moral support. The carbon atom feels a bit more stable and relaxed and is getting the ‘orbital hug’ (hyperconjugation) from both sides. It’s not very stable, but it can form under the right conditions. You’ll see these forming slowly in your Alkene reactions and more. This is where we start to enter the realm of ‘stable’ carbocations. The deficient carbon atom has 3 nearby alkyl groups completely surrounding it with orbital hugs for moral support in the form of hyperconjugation. This is the fastest carbocation to form when there is no nearby resonance and will result in faster reactions in alkenes, substitution, elimination and more. Moral support and hugs will only take you so far. They can empower you to deal with your burden, but at the end of the day, you’re still stuck with that burden. Now imagine that instead of just ‘friends’ coming over to support you and hear you vent, your classmate comes over so that the two of you can work through the problems together! Perhaps your classmate is better at orgo than you. Perhaps your classmate isn’t as proficient. But, as long as both of you are dedicated to working out the problems, can you see how the actual help will instantly lessen the burden? The point is, now you’re carrying LESS THAN 100% of the initial burden, it may not be a 50/50 split but you’re still required to carry less of that overall burden. That’s how I envision resonance. Alkyl groups will stabilize a carbocation, but will NOT help lessen the actual physical burden. Resonance structures allow the charge to be shared among two or more atoms allowing each individual atom to carry a smaller portion of the overall burden. An allylic carbon is one that is directly attached to a pi bond. An allylic system has a minimum of 3 carbons. The allylic carbon and the nearby double bond. DO NOT confuse an allylic group with a vinyl group. A vinyl carbocation has a positive charge ON THE SAME carbon as the double bond. This is VERY, VERY, unstable and ranks under a methyl carbocation in stability. Allylic carbocations are able to share their burden of charge with a nearby group through resonance. When resonating, the burden of charge is shared between 2 (or more) carbon atoms just like the homework assignment being worked on by two students. This concept requires a solid understanding of resonance. Just as with alkyl carbocations, nearby groups will still help stabilize the charge. This means that a primary allylic carbocation, while stable, is still less stable compared to a secondary which is less stable when compared to a tertiary allylic pi bond. I challenge you to draw out resonance for the systems below and verify the substitution on the yellow highlighted carbon atom. Don’t forget to rank both the initial carbocation and the stability of the atom that accepts the carbocation. but the more substituted the pi bond, the more likely to have resonance. Having help is typically better than moral support, unless that support is REALLY, REALLY strong. Primary allylic carbocations typically rank at the same stability as a secondary carbocation. A secondary allylic carbocation will be more stable than an aliphatic secondary allylic because it has the same moral support AND resonance. Tertiary allylic will be even more stable. The benzylic carbocation is NOT a positive charge on benzene itself. Instead, it’s a carbocation sitting at the benzylic carbon –> the carbon directly attached to the benzene ring. If the carbocation is you with a homework assignment, the benzene ring is your entire study group teaming up to complete the work together. Imagine how much better you’ll do when working with 3 other motivated classmates. Everyone contributes approximately 25% of the effort and your assignment is complete. 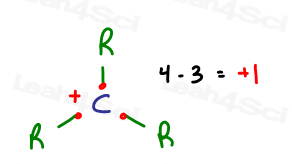 Benzylic carbocations are so stable because they have not one, not two, but a total of 4 resonance structures. This shares the burden of charge over 4 different atoms, making it the MOST stable carbocation. Some professors will rank a primary benzylic carbocation under or near a tertiary carbocation. As you increase substitution, the benzylic carbocation becomes more and more stable. The most stable version is the tertiary benzylic carbocation. Remember when we said that stability isn’t a question of yes or no. But rather, WHICH? Which carbocation is more stable, and therefore, more likely to form compared to a less stable form? The points above should have aided in your fundamental understanding of this concept. And once you understand WHY a certain carbocation is more stable than the other, you’ll be able to quickly determine which one forms faster, or if they form at all! Now, what happens if you have a carbocation near a carbon atom with potential to form an even more stable carbocation? 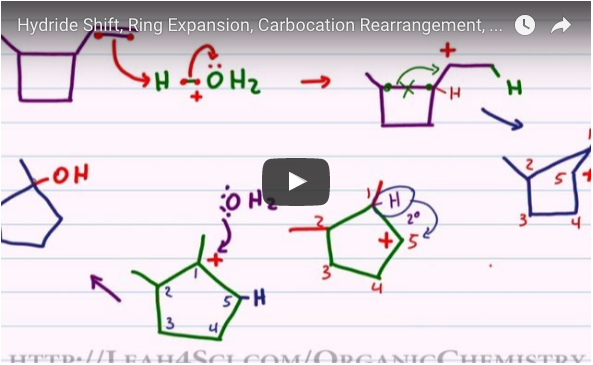 This is where we get into carbocation rearrangements, including hydride and methyl shifts, and even ring expansions. These concepts are covered in the videos below. What do you think? I’d love to read your feedback in the comments below. This was excellent thanks Leah!